PARRYS International Wolves suffered their first home defeat of the season as they were beaten 50-40 by King’s Lynn at Monmore Green. After a downpour as the riders were at the tapes for heat one, track staff worked miracles to allow the meeting to continue. 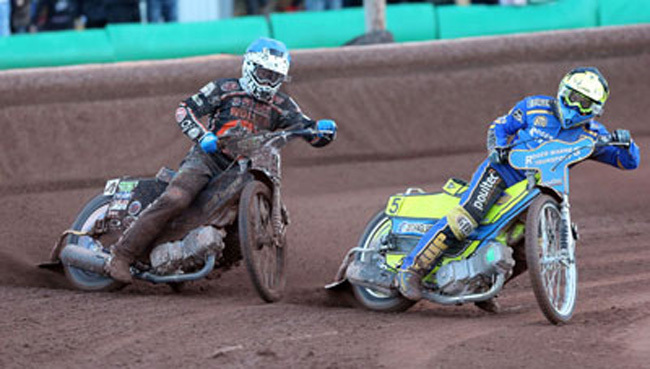 However, the tricky conditions went against Wolves as the Stars took full advantage to end their perfect home record. Peter Adams’ depleted side battled hard on what was a tough evening, with all seven riders adding useful contributions. However, with heat-leaders Freddie Lindgren and Tobiasz Musielak sidelined they lacked the firepower needed to come out on top. Skipper Peter Karlsson put in another solid display, recording two race wins on his way to 8+1, but he was frustrated to see their excellent home run come to an end. And whilst he praised King’s Lynn for their performance, he insists it would have been a different story had the weather not conspired against them. Said Karlsson: “The track conditions caught us out really. We’ve had a really nice run at home, but the rain we had really levelled the playing field big time and probably benefitted the away team more than us unfortunately. Chris Harris top scored for the hosts with a typically determined display, notching paid double figures as he stepped in for the injured Lindgren, whilst Danny King battled hard for his paid five in place of Musielak. Swedish star Jacob Thorssell ended his night with a composed race win, whilst Ricky Wells added a solid albeit unspectacular 5+1 at No.4. However, with reserve duo Josh Bates and Lewis Blackbird struggling as they ran into a rampant Steve Worrall guesting for the Stars, the Monmore men slipped to a disappointing defeat. They will be back in action aiming to get back on track after three consecutive defeats as they host Lakeside at Monmore Green next Monday (7.30). WOLVERHAMPTON 40: Chris Harris 9+1, Peter Karlsson 8+1, Jacob Thorssell 7+1, Ricky Wells 5+1, Danny King 4+1, Josh Bates 4, Lewis Blackbird 3+1. KING’S LYNN 50: Steve Worrall 14, Rory Schlein 9+2, Kenneth Bjerre 9, Robert Lambert 7+1, Niels-Kristian Iversen 5, Ashley Morris 3+2, Nicklas Porsing 3+1.